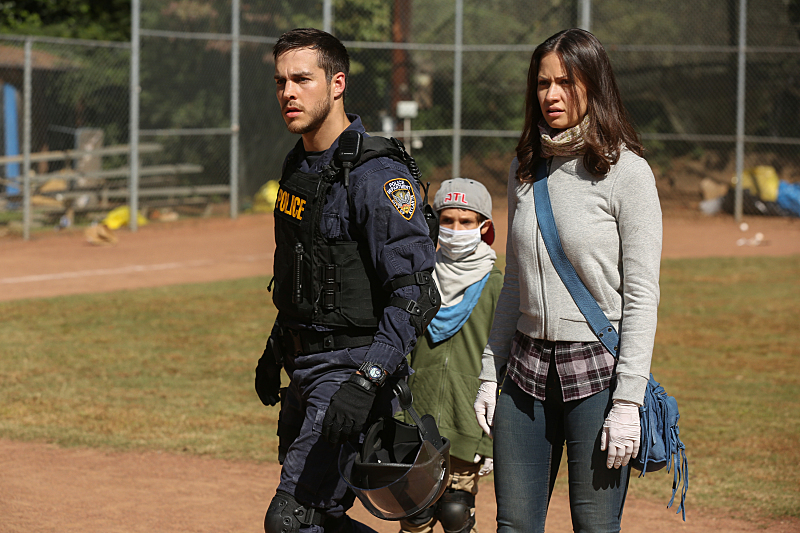 Preview images and CW description for the Containment episode "He Stilled The Rising Tumult"
The CW has released some photos and an official description for the Tuesday, May 24 episode of Containment. The episode is called “He Stilled The Rising Tumult” and you can find the description below. THE NATIONAL GUARD ARRIVES — With the sweltering heat hitting the triple digits and life outside the cordon returning to normal, Lex (David Gyasi) moves full steam ahead in an attempt to uncover the truth behind a potential government cover-up. Meanwhile, when Katie (Kristen Gutoskie) learns that Thomas’ (guest star Donielle Hansley) entire family has succumbed to the virus, and Thomas is now missing, she and Jake (Chris Wood) set out to find him. After discovering that one of their captors may have contracted the virus, Xander (guest star Demetrius Bridges) and Teresa (Hanna Mangan Lawrence) plan their escape from the grocery mart. Christina Moses and Trevor St. John also star. Michael Allowitz directed the episode written by Elizabeth Peterson (#106). Original airdate 5/24/2016. Here are some preview images. Browse KSiteTV for more Containment coverage! Containment -- "He Stilled the Rising Tumult" -- Image Number: CON106_0063.jpg -- Pictured (L-R): Chris Wood as Jake, Zachary Unger as Quentin and Kristen Gutoskie as Katie -- Photo: Quantrell Colbert/The CW -- ÃÂ© 2016 The CW Television Network, LLC. All Rights Reserved.